The patented technology uses a diesel power engine to agitate hydraulic oil in a flameless, low-pressure environment. An overspeed air intake shut-off valve is standard on this equipment. The oil is heated and circulated, not burned, providing a clean pollution free discharge to the target environment. Safety features are incorporated to protect the investment of your Therm Dynamics heater. 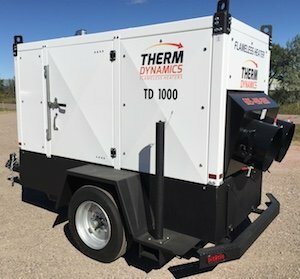 Our versatile, portable heaters can be used in hundreds of applications including thawing frozen ground, heating buildings or structures, curing concrete, drywall/paint drying and removing excess moisture to inhibit mold growth and any other application that requires clean, dry, flameless heat.